Over the August bank holiday weekend, I sipped my way through three delicious light elegant Syrahs from the Northern Rhône. Over the last few years, probably only Pinot Noir has given me more pleasure than wines from this region. Most have a seductive delicacy and finesse combined with light alcohol and a savoury edge. 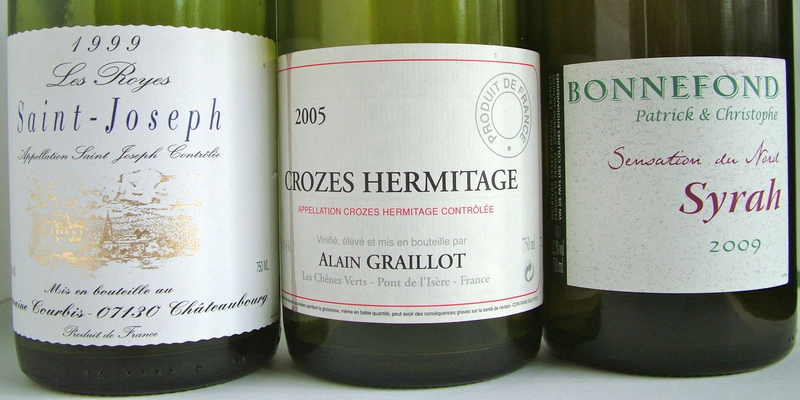 Bangs per buck Alain Graillot’s red Crozes Hermitage must be one of the best value wines in the market. Both red and white sell for under €30, and both are accessible young but with an ability to age – a wonderful combination. The red is never big nor alcoholic winning you over with its subtle charms. I have drunk many vintages and rarely been disappointed. This was a bottle of 2005, given to me by a friend. It was great wine; light elegant with slightly pithy dark cherry fruits, some liquorice and a pleasing underlying earthiness. The finish was silky smooth. I savoured it over three days and it was as good the third day as the first. The Saint Joseph 1999 Courbis was another gift, originally cellared in one of the Oxbridge colleges. 1999 was a great year in the northern Rhône. The wine did not have quite the elegance of the Graillot, but had lovely developed medium-bodied savoury dark fruits and very good length. Really delicious wine. The third wine was a 2009 Vin de pays des collines Rhodanniennes Syrah from Christophe Bonnefond, one of the up-and-coming producers in Côte Rotie. This was made from young vines I think. It was very good, lighter than the others but with lovely purity of fruit. There was a little new oak on the finish in particular, but it never overshadowed the smooth fresh ripe dark fruits. It sells for just under €20. Mine came from Jus de Vine in Portmarnock.